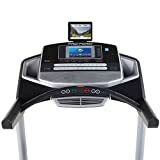 The Proform Premier 900 treadmill is a premium class machine, excellent for cardiovascular workouts, which can run belt up to 0-22KPH (0-13.6mph) thanks to a smooth-working, powerful 3.0 CHP Mach Z- commercial motor. For an unparalleled stride comfort, there is a generous 51cm x 140cm (20″ x 55”) running deck, including a remarkable ProShox- cushioning system responsible for impact attenuation during challenging running sessions. To spice up your workouts, the Premiere 900 includes 12 levels of incline adjustable with Quick Incline- controls conveniently, as well as 31 diversified training apps to suit the needs of the most demanding runners. Alternatively, thanks to iFit® technology you can utilise professional workouts cautiously prepared by certified trainers. Furthermore, to save up space after training, the machine can be easily folded thanks to the Space Saver- technology and EasyLift- assist. Additionally, you can track your workout progress thanks to a 7″ Web-enabled full-colour touchscreen display offering quality viewing experience.